This entry was posted in domesticality. Bookmark the permalink. at least you feel powerful while doing it, and that’s something. My word, Magoo is looking all grown up. I can’t believe how your writing can be so fascinating even when talking about something as mundane as yard work. Would love to try it. Why don’t you and your power washer come for a visit? We could really use it now that I did yard work and pulled up a dead bush… with lots of fat earth worms, roly polies and rich clayish soil. Uh, yeah… I made a mess on the sidewalk, but the flowers in place of the dead bush looks really good. Baby steps. I’m working on baby steps. 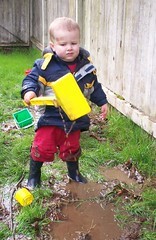 Oh, how my little man loves mud! He must be of the male persuasion. I’ve never been much into it myself. As for the power washer, you go girl. I love getting things nice and clean by shooting them with powerful spray…now, if I could just figure out a way to make it work inside the house. So when I move in next door, can I borrow your power washer? I can hear Tim, the Tool-man Taylor now…..LOL!! I’m printing up a tshirt for my neighbour (like that Candian spelling?) who has a power washer. I WASH THINGS. POWERFULLY. That picture is one of the most precious things I have ever seen. He is well on his way to being a power washer, himself, I’d say. Spring is here…woohoo…time to spray all those petals outta here!